I last posted just before my little jaunt down to Tree Elle to see my brother get married. What do you do the day after your wedding? Well, I’m not sure what normal people do, but my brother and new sister-in-law had their alpaca(s) shorn. 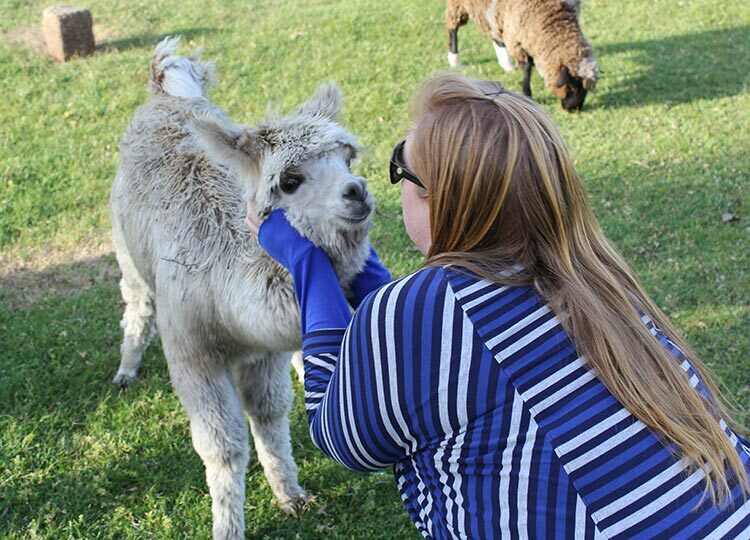 Here’s a photo of my new sister-in-law with Ally the alpaca. This was an “I’m uninspired so I’m just going to cut fabric up and see what happens” quilt… As far as improv experiments go, I’m quite pleased with it. I quilted it with Aurifil 28 and 40 weight, quilting blue on orange and vice versa. The feature fabric was part of the Fugly Fabric Swap I ran a few years back with Lucy of Charm About You. I didn’t think it was fugly – the little shops are so cute! It was quite windy today so QuiltDog No2 helped out. This year has been crazy busy – teaching leaves no time for sewing and I’m back in the classroom full time next year. I’ll be pouring my creative energies into devising cunning ways to engage young minds… so five years after starting TGIFF with MR from Quilt Matters, I’m bowing out. We started TGIFF with the aim of giving ourselves motivation to actually FINISH quilts, but also to give other quilt bloggers the opportunity for exposure to different audiences and to help people build their skills in blogging and networking. I think we’ve done quite well and I’m really proud of what we’ve achieved. It’s been an amazing journey, I’ve met some fabulous quilters but for now, it’s over to MR and the rest of the team to keep the flame alive… Ok, that’s a bit melodramatic. Over to you. What have YOU finished lately?! Even though you are not doing TGIFF I hope that you keep in touch. I enjoy your posts and your projects. 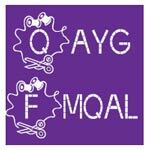 I am sure you will settle into a quilting routine soon. I have enjoyed seeing everyone’s finishes over the years, thanks for hosting a great link party. Oh no, I have no finish to link up 🙂 It’s hard to finish things! All the best for upcoming 2017! Your improv piece is great. I wish I could sit down and create like that without a pattern. I hope your hand gets better soon. Kudos on knowing when to step back from something. Thanks for all that you’ve done for TGIFF. Merry Christmas.